So these guys are done. I know that means this is less of a “work-in-progress” post. 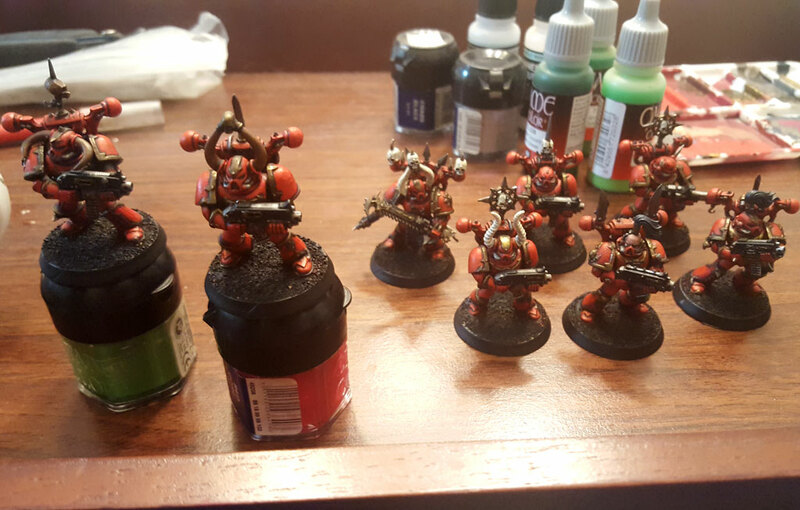 But this group of Chaos Space Marines, who are for now in my Khorne Daemonkin army, I think deserves a final “work-in-progress” post. Just a quick update for WIP Wednesday. This squad is moving along nicely. Just a couple more need the bone/horn pieces painted. Then I’ll shade those and move on to overall highlights. Hope to see them done soon! So I finished up this one the other day, but hadn’t posted about it yet. 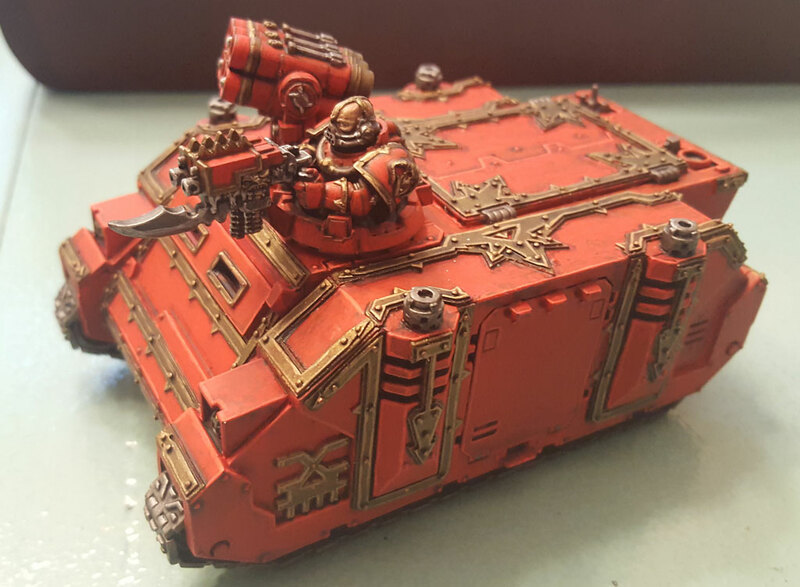 In my last post about this Khorne-marked Chaos Space Marines Rhino, I think I was actually like at 95 percent done. I just needed to add some highlights to the gunner and havoc launcher. Looking at it all together, I really like how this Rhino came out. A lot of that has to do with the trim kit from The Dark Works. The kit just adds that little bit of flair to really push it into the Chaos aesthetic, especially for something in the Khorne Daemonkin or World Eater vein. This is just a quick updated for Work-in-Progress Wednesday. I’ve made some headway on my Khorne Daemonkin Chaos Space Marine squad. As you can see, the red and Boltgun Metal base coats are down. Next is gold and the base coat brown I use for the horns. Then I’ll clean up the reds where mistakes were made. More updates and pictures to follow. For the most part, all the regular Chaos Space Marines units I’ve ever built have gone right into Black Legion colors. 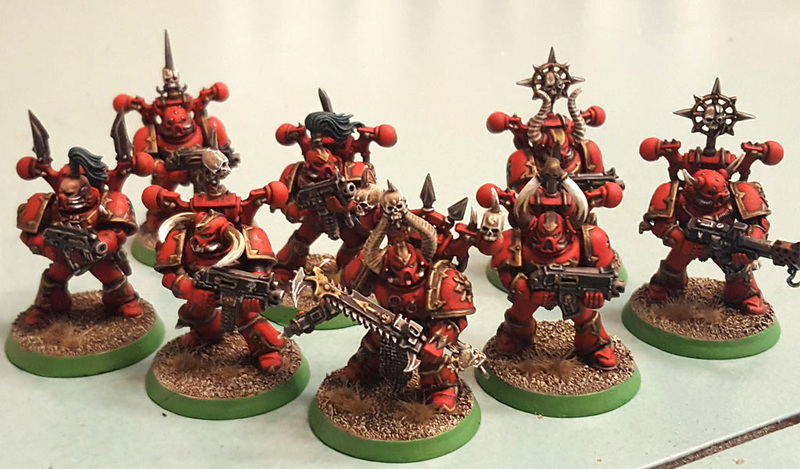 Cult troops (Khorne Berzerkers, Plague Marines, etc.) 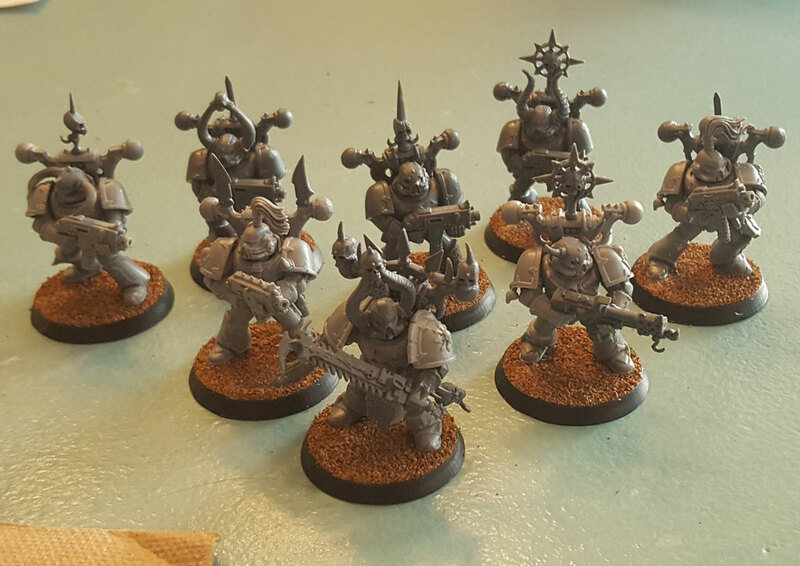 got their cult army colors, but my regular Chaos Space Marines – including transposable units like Chaos Bikers and Havocs – all were painted in Black Legion colors. There were two reasons for this. First, Black Legion was my first Chaos Space Marine force, and my first Warhammer 40,000 army to boot. Second, the Black Legion fluff always indicated that some units could be open to operating with other CSM factions. So if I wanted Nurgle-marked marines that were not Plague Marines in my Death Guard force, I rolled in some of my Black Legionnaires. I did this even in the more WYSIWYG editions with no problem. However, when I started my Khorne Daemonkin force, I decided to do up some Chaos Bikers in the red-and-gold getup. And after playing some games using my Black Legion guys as Khorne-marked CSM, I started to get the feeling that the guys in black and gold looked out of place. I really wanted a more uniform looking force. 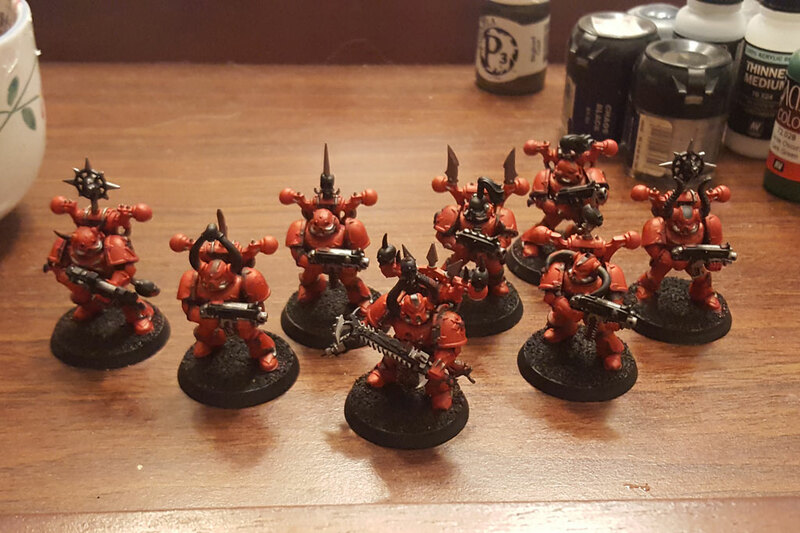 So I decided I’d put together some CSM and paint ’em up the same as the rest of my Khorne Daemonkin army. And now I’ve finally started that process. Yes, even though the Khorne Daemonkin might cease to exist as an army, I should still be able to use the models. But, I’m hoping to have them all painted up before the next edition drops. You can see the assembled models above. The careful observer will note that I have three of the snap-fit Chaos Space Marines included in this squad. I had them laying around in the box of unbuilt models and figured, like Jack Burton says, “what the hell?” Another thing the careful observer will note is that there are two distinct shades of grey plastic on those models. Yep, that’s right. Some of those kits have been sitting in my box since pre-2007, which is when I think the CSM sprue got updated and the sprues came in a darker color.